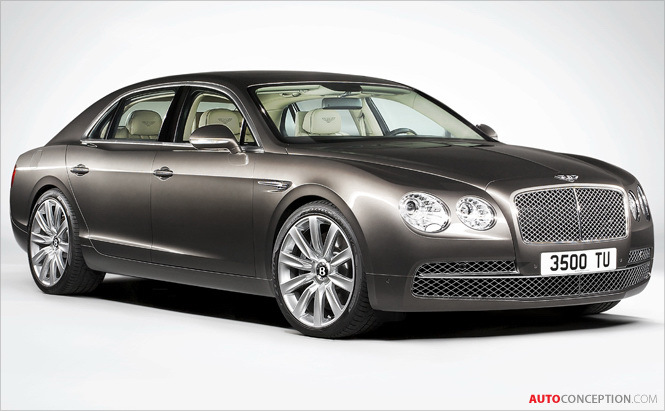 Bentley’s new Flying Spur, the company’s most powerful four-door model ever, makes its global debut at the 2013 Geneva Motor Show. 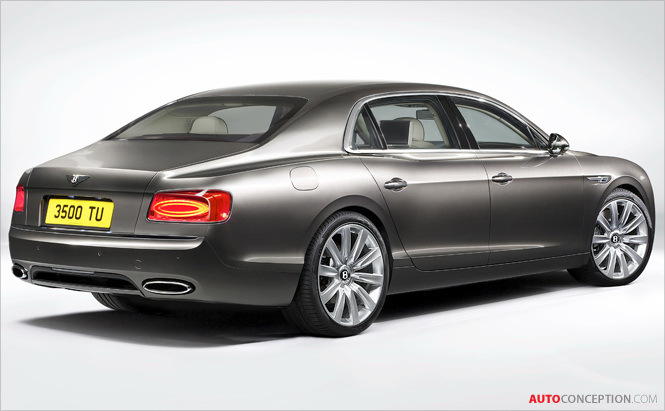 Powering the new Flying Spur is Bentley’s 6.0-litre, twin turbo W12 engine, coupled to a ZF eight-speed transmission. 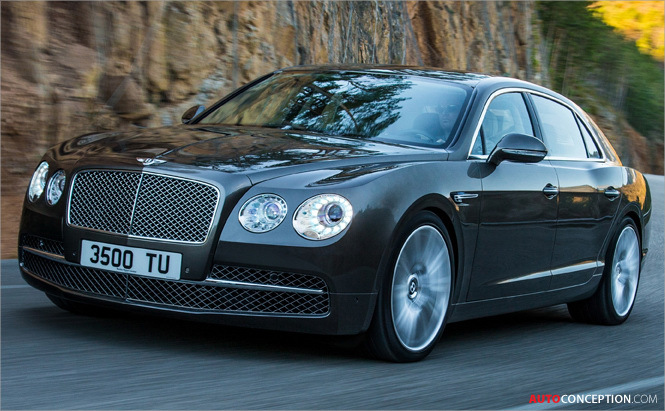 Developing 625 PS (616 bhp) and 800 Nm of torque, the new Flying Spur features more power than any other Bentley four-door in history. A 14 per cent improvement in the power-to-weight ratio over the outgoing model delivers a 0-60 mph time of 4.3 seconds and a top-speed of 200 mph (322 km/h). 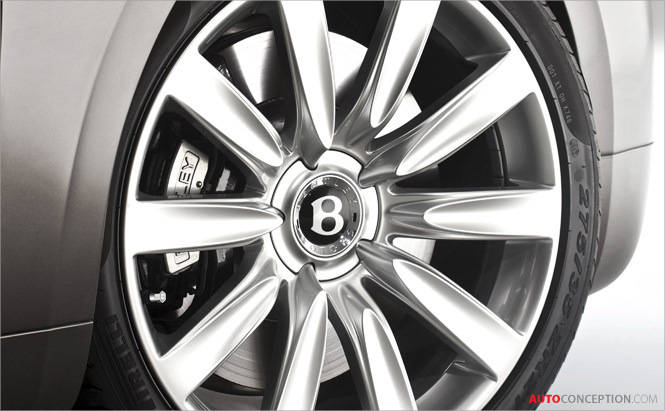 In keeping with modern Bentley tradition, power is delivered to the road via all-wheel drive with a 40:60 rear-biased torque split for an improved drive in all road and weather conditions. 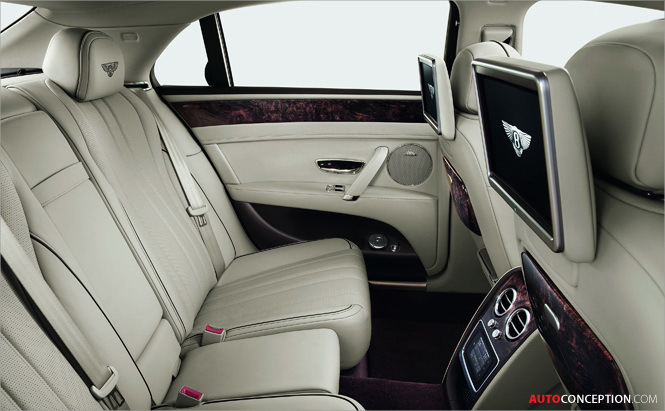 Bentley’s styling team has attempted to create an “athletic” design for the new Flying Spur that combines traditional Bentley styling cues with a more sporting stance and contemporary details. Sharp feature lines add to muscularised rear haunches, while LED day-time running lights, dipped headlights and taillights characterise the front and rear profiles. 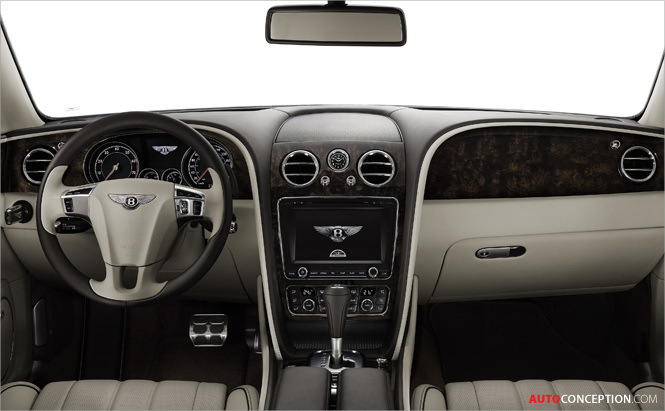 The interior designers have created a luxurious cabin environment that dresses acoustic and electronic technologies in hand-crafted leather hides and wood veneers. 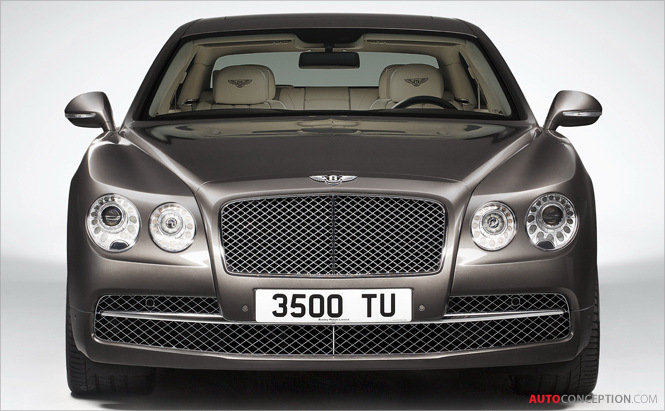 The front fenders feature a new wing vent complete with a Bentley “B” motif. From here, an additional feature line forms a sharply defined edge running from the front wheel all the way to the rear bumper. 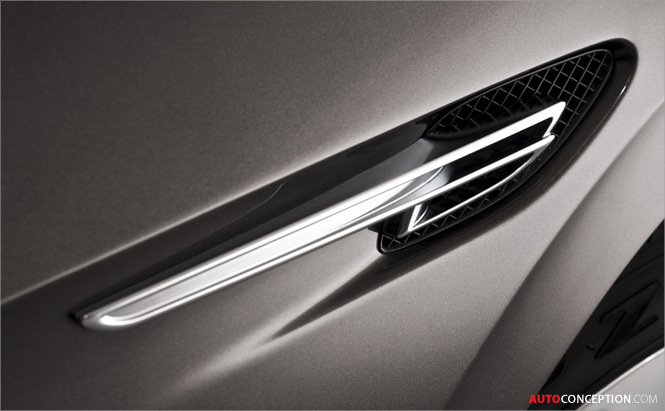 At the front of the car, a more upright chrome grille sits between the LED headlamps. 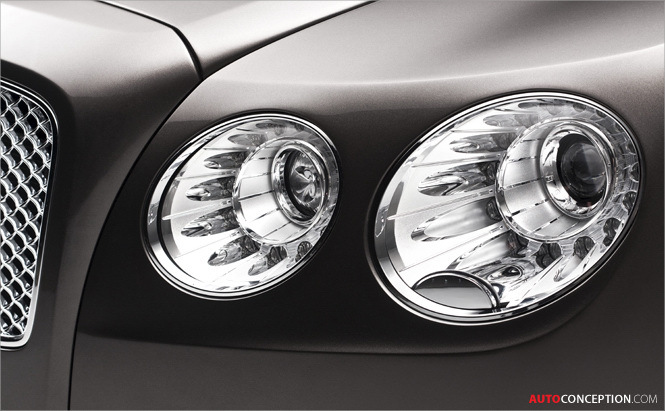 Emphasising the lower, wider stance, the outer lamps are the larger of the two. 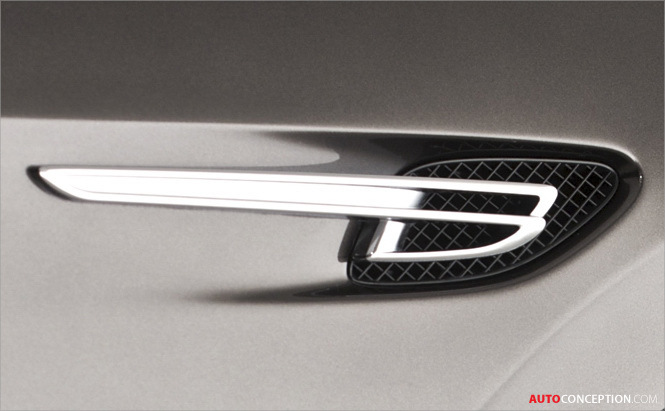 Beneath the front grille, the lower intake is now full width with no vertical divisions, but instead with a chromed horizontal accent that completes the face of the new Flying Spur. 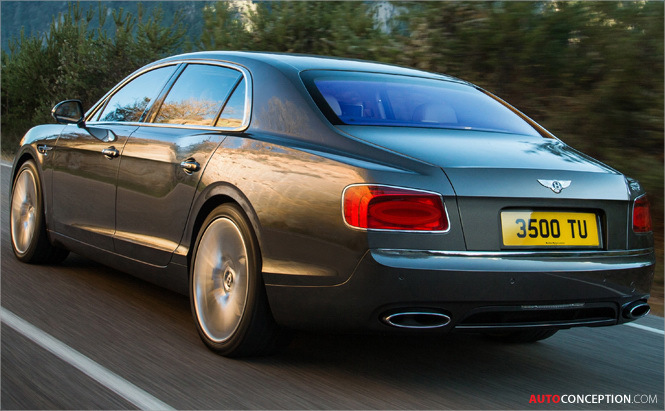 At the rear, a longer and lower boot lid lends a more swept appearance to the side profile. 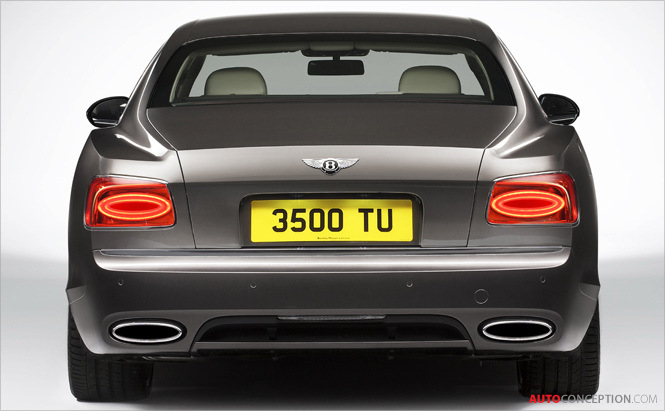 Horizontal single ellipse LED tail lamps combine with a new interpretation of the Bentley “Horse Shoe” feature line, now running the full width of the car and encapsulating a concave section. Beneath the skin, a range of materials is applied in order to improve overall body stiffness and refinement whilst meeting crash performance targets and pedestrian protection legislation. The new body structure includes reinforcement to the B-posts, sills and front crossmembers together with deformable components in the floorpan for optimal load transfer. A deployable bonnet that includes both new reinforcement panels and deformation elements helps to improve pedestrian impact performance. The bonnet and front fenders are constructed in aluminium, with the fenders shaped using the aerospace-industry superforming technique, employing compressed air to shape heated sheets of alloy into the required form at over 500°C. 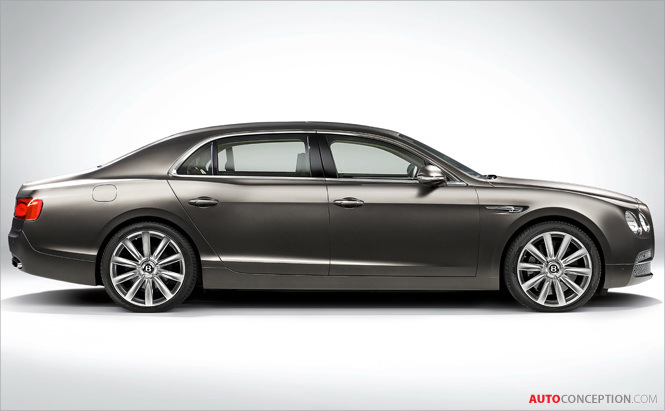 With a torsional stiffness of 36,500 Nm/degree, a 4% increase over the previous generation Flying Spur, the new bodyshell provides a more rigid platform for the chassis components and a stable foundation for NVH reduction. The newly shaped vehicle has an overall drag coefficient of 0.29. Weight savings in the body structure and throughout the car mean that the new Flying Spur is 50 kg lighter than the first generation car.